Econoco’s slatwall panel display hook is ideal for your retail store display or at home use! These panel display hooks have a glossy Black finish making them stylish while remaining incredibly durable. Made of wire, these display hooks are a deluxe ¼” diameter with 45° upturn at the end; primarily designed for small packaged goods or lightweight items.Their backplate configuration also allows the hook to fit to any normal slatwall with or without additional inserts. Also, these slatwall deluxe hooks come in a 96-piece set. BLACK DELUXE HOOK - These panel display hooks allow you hang all of your items beautifully and with confidence. Because the hooks have a Black finish, the slatwall panel display hooks are stylish, while still maintaining practicality. 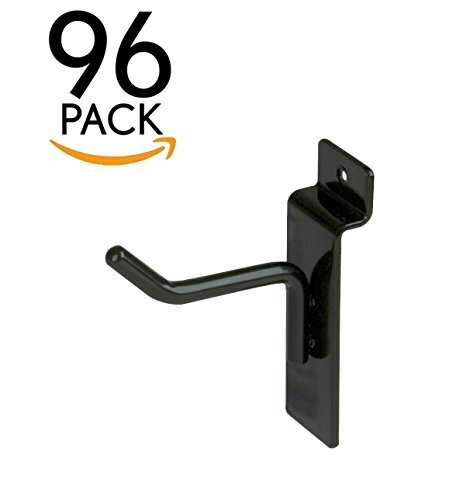 DURABLE - These commercial grade panel display hooks are incredibly durable and have a glossy Black finish. Use the hooks in a retail setting or at home. Also, use the display hooks with confidence because of their durable nature.